Recently, we released a new version of VIY3 software. Software version #3.9.1.27. GPS tab window is divided into two sections. 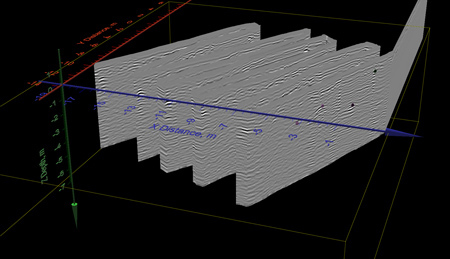 In the right window – current GPR profile is displayed. In the left one – passed way in meters is displayed. In the upper part of window – information from GPS receiver. In this tab you can also test working of your GPS receiver with visualization of the trek, displaying of current coordinates and accuracy. 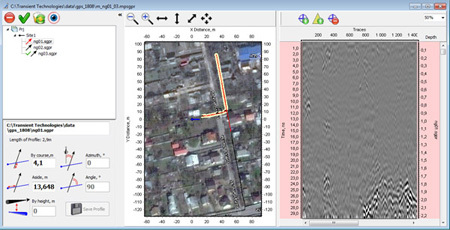 After finishing of sounding process, GPS trek will be added to user’s GPR profile. 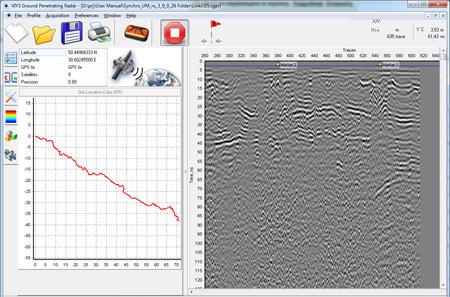 Now both: normal (straight) GPR profiles and GPR profiles that were acquired with GPS receiver – can be displayed in the program.